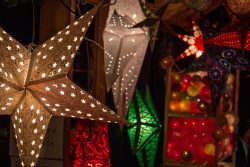 German Christmas market trips engage students in cross-curricular learning outcomes as well as providing them with a cultural eye-opening experience and chance to shop in gorgeous markets full of treats! A favourite with schools seeking an opportunity to engage in cross-curricular learning outcomes as well as providing students with a cultural eye-opening experience, the Christmas market visits have already begun for Travelbound groups with markets opening up at the end of November. What can you expect from our top 8 Christmas markets in Germany? Location doesn’t get much better for UK schools groups than the German border town of Aachen. Outstanding architecture welcomes students as they weave amongst the historic buildings. The UNESCO World Heritage Site of Aachen Cathedral is a must explore spot standing as the oldest cathedral in northern Europe. Dominating the market square, Aachen Christmas market becomes a festive village bursting with variety. Students can expect to see a vast collection of themed craft pieces as well as stylish and precious goods. Illuminated by Christmas lights, students can explore the streets around the town hall which extend the Christmas feel throughout Aachen. Be sure to try out the Aachen Printer, which classes itself as a variety of gingerbread. Aachen Christmas market is also known for other traditional food items, including “Domino Stones” and “Spekulatious”. 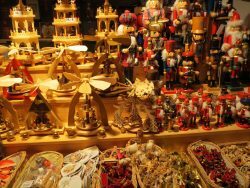 The popular Gendarmenmarkt Christmas market hosts everyone from skilled wood carvers to musical ensembles. Charlottenburg Castle provides both temporary and permanent exhibitions and is a great sport for students to learn about ancient handicrafts. Using methods handed down through the centuries, students can discover much more than the atypical craft fair. The Sony Centre at Potsdamer Platz is also a popular go-to location for getting in the Christmas spirit. Along with carefully crafted handicraft, the Christmas market also features Europe’s largest mobile toboggan run and an open air ice rink. Hunting the Christmas markets in Berlin opens up a world of knowledge into craftsmanship and traditional German food. It helps ticks off the many historical sites Germany’s capital has to offer. Christmas markets have a habit of conjuring a magical atmosphere; a dreamlike fantasy land themed around the antics of Saint Nicholas. As a theme park, it seems appropriate Europa-park takes its roleplay to the next level offering visitors their own Christmas market experience. A magical winter wonderland filled with decorated fir trees, cobbled pathways illuminated by thousands of fairy lights, and more attractions than demonstrated in a chemistry lesson at school. Rewarding your school cohort or looking for a mix of leisure entertainment with language? Europa-Park allows for teachers to provide a school one minute and then meander amongst the traditional German market stalls. Tuck into culinary treats, including cinnamon sticks and roasted chestnuts, or take in a festive show. Bringing together a full programme of festive events with the theme park’s rides and attractions, a Christmas market visit to Europa-Park is one few will forget. Head for the largest of Freiburg’s squares Münsterplatz renowned for its historical Merchants’ Hall and dominating architecture. Bringing together the beauty and nature of the Black Forest with the art of traditional craftsmanship, Freiburg’s Christmas markets give students an insight in the region’s culture. From ornamental items and decorations to wooden toys, the number of items available is only bettered by the intricate work placed on each item. 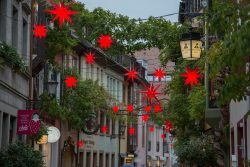 There is more to Freiburg than the colourful corner houses that create a bold outline around the Christmas market squares. Freiburg’s canals add character to one of the Black Forest’s most picturesque towns. There are many theories as why the canals along the narrow streets were first built. A long running superstition tells a story of visitors who step foot in the canals’ water are destined to return to Freiburg. Who wouldn’t want to see the biggest Christmas tree in the Rhineland? Yes an impressive feat, but Cologne offers students so much more. 160 beautifully festive pavilions give students a Christmas market experience to remember. 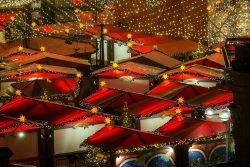 Take a trip to Cologne’s most notable Christmas market which sees the square dominated by the city’s cathedral. Sitting as one of seven Christmas markets available in the city, this market is a must-visit providing students with everything from traditional food stalls to handcrafted Christmas goods. In addition to the cathedral, school groups can include a visit to the city’s chocolate factory and the nearby theme park, Phantasialand. Groups can also discover Roman culture at the Romano-Germanic Museum and trace the story of sport with a visit to the German Sport and Olympia Museum. 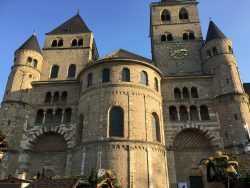 Journey just over an hour south of Cologne, the ancient city of Koblenz presents students with an idyllic location on the edge of the Rhine and Moselle. 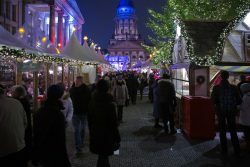 Head for the old town to experience the Christmas markets and main shopping area. Take advantage of the chance to interact with native speakers supporting students as they put their German language skills to the test. Identify the local dialect and consider how to improve intonation. Be sure to head for the bakery stalls offering a memorable insight into their secrets and enticing stolen. The 130 wooden stalls provide an endless amount of Christmas present ideas and inspiration to encourage design and technology students. 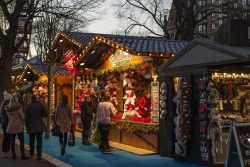 Capture the festive spirit in a city that has all the ingredients to be one of the most picturesque areas to hold a Christmas market attracting visitors from near and far. 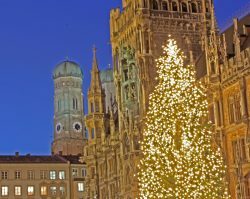 Bavaria is one of Germany’s most well-known regions and its Christmas market having its roots in the 14th century, it is of little surprise Munich continues to attract school and further educational groups year after year. Held in the city centre, Munich Christmas market allows students to experience the best in traditional Bavarian dishes and unique crafts. Explore the famous regional glassware and sample the freshly baked gingerbread. Look to the balcony of the town hall where students will be able to enjoy a special alpine concert. Munich provides an opportunity for students to experience a range of interactive museums and galleries. From the Alte and Neue Pinakothek galleries to BMW World! Step back to explore the stories that shocked the world with a visit to Dachau or marvel at the architecture on display at Nymphenburg Palace. Few places can boast holding 9 UNESCO World Heritage Sites. In fact, you’ll likely struggle to find another. Trier presents students with a unique historical city set on the Moselle River. A city founded by the Romans, students can still visit the Imperial baths and amphitheatre. While there are plenty of traditional gifts on offer within Trier’s 95 wooden huts, it is the food that must get an honourable mention. Sweet treats aplenty, students are unlikely to return home hungry though parents will likely hope some German festive treats survive the trip back. Don’t miss the potato fritter stands as students warm their stomachs and share in a magical Christmas experience in Trier.